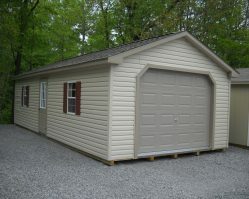 Our Peak Style Garages all include one 36” entry door, one 24” x 36” window, and one 9′ x 7′ insulated steel garage door. 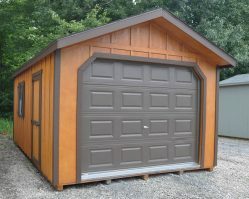 Of course you aren’t limited to what we have in stock and can custom order your garage to add additional features that suit your needs completely. 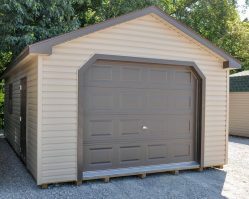 These portable garages are great for use as an everyday garage for your car or pick-up truck, lawn equipment, or recreational equipment. They also work great as a workshop or a place to work on that antique car restoration project. The floors are constructed of ¾” pressure treated plywood placed over pressure treated 2×4’s spaced 12” on center over 5 pressure treated 4×4’s running the length of the structure. With lifetime architectural shingles, our garage structures will provide you with many years of maintenance free service. Rent TO Own $282.32 Per Month Or 12 Months Same As Cash. 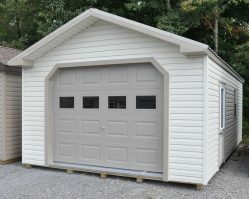 Our portable garages are great for use as an everyday garage, for compact tractors, or for recreational equipment. They also work great as a workshop or storage for that antique car project. Use as a backyard tinker shop, a man cave combination, or many other uses! Rent TO Own $457.00 Per Month. 1. Any products listed on our website are in stock, but could be SOLD upon your arrival. Replacement items can be ordered but usually take 3-6 weeks for delivery. Always call before driving a long distance to ensure we still have the item you're interested in.